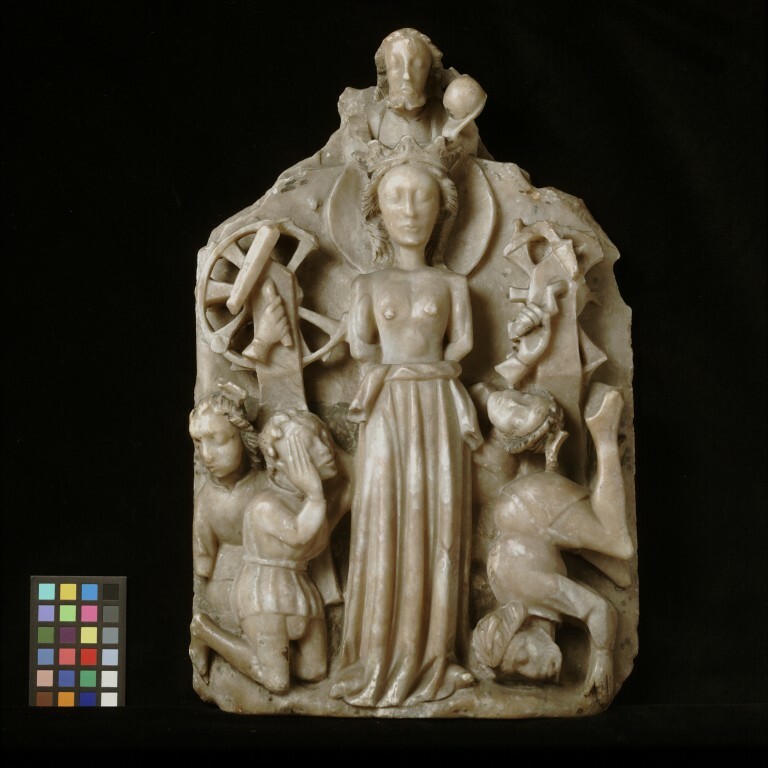 This panel represents the legend of St Catherine's miraculous release by angels from death by torture on spiked wheels. The executioners and bystanders were killed by broken pieces of the wheels and the saint was beheaded instead. She is shown haloed and crowned standing in the centre of the panel with her hands behind her back. She is naked to the waist and her gown is tied by the sleeves around her waist and her hands are attached to posts on the right and left sides of the panel. The wheel the symbol of her martrydom is shown broken on the left hand side of the scene. Saints are the heroes and heroines of Christian faith. In the 14th and 15th centuries, they were a popular subject for alabaster carvings. Religious themes penetrated private life, so devotional images of saints were sculpted not only for church interiors, but also for individuals to contemplate within the privacy of their homes. The haloed and crowned figure of the saint stands in the centre of the panel, her hands behind her back. She is naked to the waist, her gown tied by the sleeves round her waist. The spiked wheels, with handles, are attached to posts on the right and left sides of the panel. On the left of the panel kneel two figures wearing short, belted tunics. The right-hand figure looks up at the saint, his hands held to his head; the other looks down to the left. On the right of the panel a bearded figure wearing a low-belted doublet is falling over. Above him is the head of a torturer, his hand on the handle of the wheel on the right. Swords (broken) are represented crossing the wheels. The bearded figure of God the Father holding an orb in his left hand is at the top of the panel. The top of the panel is broken and the top corners are missing. The wheels and the swords are damaged. The angels, who are usually represented holding the swords, are missing. Slight traces of green paint remain on the ground at the bottom of the panel, with traces of the usual daisy pattern. Slight traces of colour remain on the figures, especially traces of black on the hair of the torturers and of gilt on the saint's hair. The back of the panel is marked. There are two lead-plugged holes, one with the traces of latten wire attached. The bottom has been cut away. 3 parallel lines and what appears to be an 8 or B. Acquired by Dr W. L. Hildburgh in Paris. On loan to the Museum from Dr Hildburgh since 1927.Given by Dr Hildburgh in 1946. Alabaster panel depicting St Catherine saved from the wheels. English, 15th century.